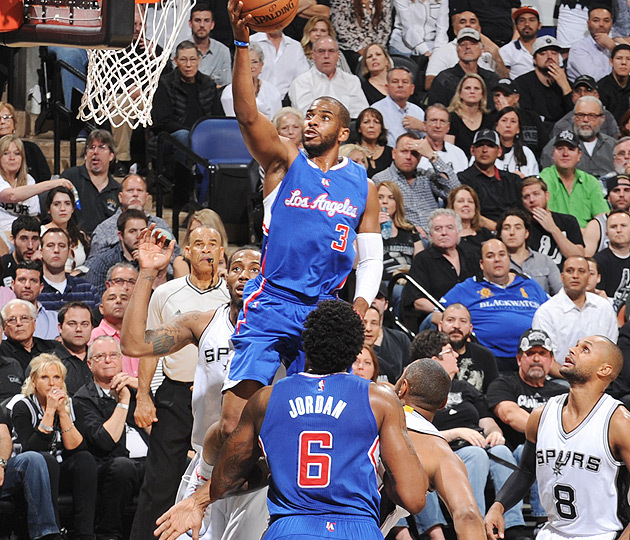 The Clippers avoided elimination and forced a Game 7 by defeating the Spurs 102-96 in San Antonio on Thursday. The best first-round matchup, on paper, has been the most entertaining, the least predictable, and the tightest. Now, fittingly, it will go the distance. The Clippers avoided elimination by beating the Spurs 102-96 in San Antonio on Thursday, setting the stage for Game 7 at the Staples Center on Saturday. Both West powers entered the series with top-three rankings in point differential during the regular season, and their back-and-forth-and-back-again series has been just about as close as it can get. Through 293 minutes over six games, the Spurs have outscored the Clippers 615-610 for an average score of each game of 103-102. Spurs coach Gregg Popovich memorably quipped after Game 5 that Tim Duncan couldn't jump over a "proverbial piece of paper," and this series has been so close, in totality, that you couldn't slip that same sheet between these teams. Understandably, Popovich wasn't in a joking mood after San Antonio's Game 6 loss. He didn't raise his voice or get particularly dismissive, instead favoring a cool rage as he ripped his team to shreds. It was a mystifying performance—flat, choppy, imprecise—for a championship team at home with a chance to advance. "Our execution at the offensive end was really poor," Popovich said during his postgame press conference streamed on NBA.com, adding that San Antonio played "soft" on at least three separate occasions during this dissection. "No excuse for it. Just poor. We should be embarrassed in the way we came out for a closeout game, in every regard." [daily_cut.NBA]There were long stretches of this game in which an incredibly rare question was suddenly unavoidable: "Where is San Antonio going to get its scoring from?" The team whose system famously makes the game look easy couldn't get anything, from anybody. San Antonio managed just four points during a 7-plus minute stretch straddling halftime and it endured a 3-plus minute scoreless stretch early in the fourth quarter. Both droughts were critical: the Spurs had a 10-point lead midway through the second quarter and failed to capitalize on a wobbly start from Chris Paul, and their slow start in the final period seemed to re-energize their opponent. For once, the centerpieces couldn't hold. Duncan, limited by foul trouble, scored 12 points on the night and took just two shots during the second and third quarters. Kawhi Leonard, so efficient early in the series, struggled to a 3-for-15 shooting night, shooting 1 for 8 in the painted area. Manu Ginobili suffered through his least-effective performance during a series of little impact, making just one shot in six tries and playing only 14 minutes. Danny Green (1 for 5 on threes) had his fourth milk carton offensive performance in six games. Tony Parker was badly outplayed by Paul, again, a fact that would have been even more glaring if not for the second-unit heroics of Marco Belinelli (7 for 11 on three-pointers, including two late in the fourth quarter) and Boris Diaw (17 points and five assists). "I don't know how we stayed in the game to be honest with you," Popovich continued. "It was very disappointing to see the group approach [the game as it did]. ... We have to move the ball and play to win. You can't hold the basketball. When someone is physical and you hold the ball, the whole thing is exacerbated. You can't get anything done." ​Given life, the Clippers seized the game. Blake Griffin (26 points, 12 rebounds, six assists) was a dominant force again, but not through momentum-altering dunks. Griffin's much-ballyhooed midrange jumper, the subject of so much off-season work and subsequent attention at the start of the regular season, was on full display in the second half, as he shot 5 for 7 from the left side, repeatedly making San Antonio pay for defensive lapses. Paul (19 points, 15 assists) was right there to hold up his end of the one-two punch. After an 0 for 7 shooting performance in the first half, Paul scored or assisted on 13 of the Clippers' fourth-quarter points, including a back-breaking pass and a dagger jumper. ​With the Clippers leading by four and just over two minutes left, Paul sensed the opportunity to push the ball up the court after rebounding a Parker miss. A quick inside-out dribble near half-court sent a retreating Parker spinning hopelessly and unexpectedly led to a two-on-one situation with Griffin against Diaw. A perfectly timed shovel pass set up Griffin for an easy layup. Then, with less than 30 seconds remaining, Paul turned the corner around Patty Mills and pulled up for a soft floater over Duncan that gave the Clippers a five-point lead. "I thought his [first-half] shots were afterthoughts," Clippers coach Doc Rivers said of Paul. "In the second half, he was more aggressive." There was nothing miraculous or fluky about this. The Clippers didn't need a career night from Austin Rivers like they got in Game 4 and there weren't any dubious calls or heartbreaking turns as in Game 5. This was just Griffin and Paul rising to the occasion, and finishing the task down the stretch as they failed to do in Games 2 and 6. "That was probably one of the most relaxed games we've had as a team," Paul said. "Tonight was one of the [most fun] games of the series. ... Our team just never got rattled." The road team has won four times in this series, a remarkable fact given that the teams combined to go 63-19 at home during the regular season. The Spurs will need to make it five out of seven if they are to continue their title defense. "They've been in this situation," Griffin said. "They know not to panic." Popovich certainly isn't the panicking type, but his cutting words went beyond disappointment to disdain. Will they get through the clouds to Green? Will they conjure up a little Manu magic for old time's sake? Will they help refocus Leonard? Will they inspire a game-altering showing from an unlikely source on Saturday? Is there anything that can be said that will help Parker against Paul or any diatribe that can slow Griffin's 24/13/7 rampage through this series? Will Ginobili or Duncan decide to drift into retirement if Popovich's words don't succeed in galvanizing the Spurs?